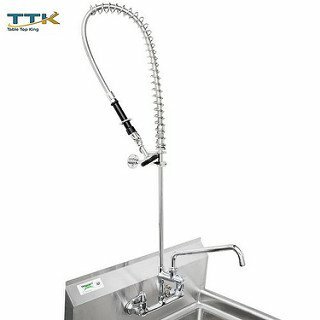 This Equip by Tabletop king 5PR-8W12-C wall mounted pre-rinse faucet features a 44" flex hose and spring design that provides plenty of versatility in a variety of warewashing applications! A 1.2 GPM low flow spray valve makes it easy to clear food debris off of dishes before washing them, while conserving water and saving you money on your utility bill. Additionally, a 12" add-on swing faucet makes your sink even more versatile, allowing you to switch between the pre-rinse setup and normal faucet depending on what you need! To make installation easy, it also boasts in-line check valves and 1/2" NPT female inlets on 8" adjustable centers. View More In Cutlery Trays. Century Components TTUT26PF Maple Wood Utensil Tray Kitchen Drawer Insert Organizer Trimmable 26-3/4" x 22"